UPDATED: Mon., June 18, 2018, 11:05 a.m.
BOISE, Idaho – Authorities say four people are dead after seven vehicles collided in a chain reaction crash near Boise on Saturday. Ada County Coroner Dotti Owens said Monday that it could take several days to identify those killed because of the condition of the remains. Idaho State Police say the crash happened on Interstate 84 late Saturday night when a semi-truck and a sport utility vehicle slowed for construction traffic. Police say a second commercial truck struck the vehicles from behind, and four other vehicles were also involved in the collision. At least one of the vehicles caught fire. Police were still working to notify relatives of those believed to be in the collision on Sunday evening. 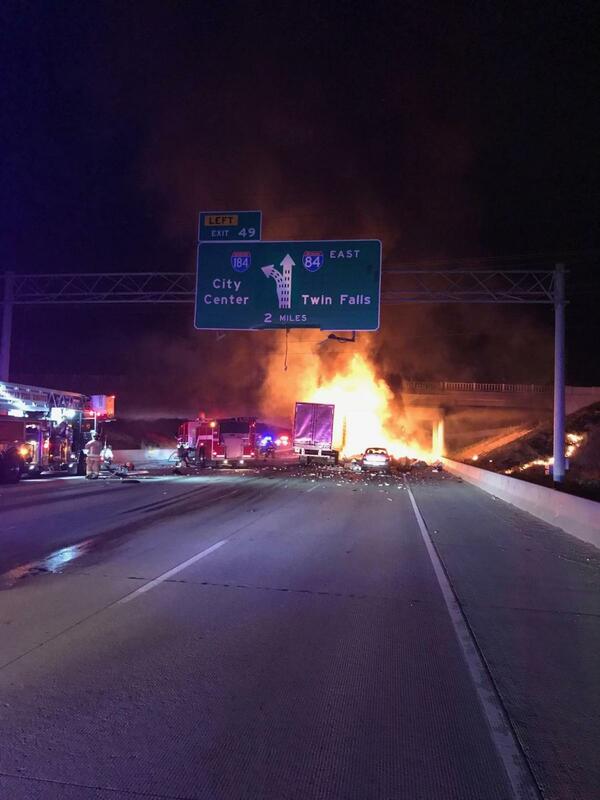 The fire damaged an overpass that crosses the interstate. Idaho Transportation Department officials say the Cloverdale overpass will remain closed indefinitely as crews survey the extent of the damage. Published: June 18, 2018, 7:57 a.m. Updated: June 18, 2018, 11:05 a.m.